True to being a Sociology major, I got interested in the topic of narcissism and rented the book “The Narcissism Epidemic: Living in the Age of Entitlement” from the library. The book talks about many aspects of narcissism like entitlement, seeking fame, the mortgage crisis, celebrity obsession and parenting practices to name a few. I’m going to focus on modern-day parenting. I was born in the late 80’s. So mostly, I grew up in the 90’s and 2000’s. There was (and still is) a growing self-esteem movement which caused practices like “participation” ribbons and trophies. I remember getting 5th place, 6th place ribbons and “participation” ribbons, which I threw away. Why is that anything to be proud of? Also, the first year that I entered high school, a new rule declared that students would not be told their class ranking. We were told if we were in the top 10% (although an error caused them to keep track of the top 20% instead; they didn’t want to hurt the feelings of the students they’d accidentally placed in the top 10%.) I can only assume the point of this was so that students wouldn’t feel bad if they weren’t in the top of the class and also to eliminate friendly competition (which seems like a good motivator to me)?? Why did this change occur in my school? Was it that teachers and principles felt they needed to protect the students’ self-esteem? Or was it helicopter parents trying to shelter their kids from the reality that a lack of effort typically earns a bad grade. Maybe it is embarrassing for the parents to have a child who fails at something. I’ve noticed the trend that parents seem to want “bragging rights” about their child, as if their child is a trophy to be shown off. (Like the stickers on cars: “My child is an honor roll student”). Consequently, if their child does slack off or fail, the parents still want the child to receive special treatment and be forgiven their faults, which does not help them learn from their mistakes. My personal theory as to why parents have placed so much of their own self-worth in their children is that we are a people who are lost. More and more, we are turning away from religion, but what are we turning to? I think many of us are adrift (including myself much of the time). I love this quote by Walker Percy: “You live in a deranged age, more deranged than usual, because in spite of great scientific and technological advances, man has not the faintest idea of who he is or what he is doing.” Maybe parents are clinging to their offspring and trying to live vicariously through them or to show everyone how successful they are because their kids are successful. There is a lot of pressure on teachers to give theirs students good grades. A teacher friend of mine said that she’s had parents who were perfectly sweet to her face, but then wrote nasty emails ordering her to give their child more chances to turn in homework or to receive extra credit. Another friend of mine doesn’t want to go back to teaching in part because of the parents she had to deal with. Children need to fail so they don’t become fragile adults who cannot cope with the real world and all of its’ hardships and rejection. Also, children who are protected from failing often take less risks because failure is an unknown and scary idea. One can’t go very far in life without taking some risks. All of the great names in history tried and failed many times before they gained success. They learned the most from their mistakes. Grade inflation is a phenomenon that I noticed while I was in high school. It seemed to me that the average person was not getting a “C” anymore. 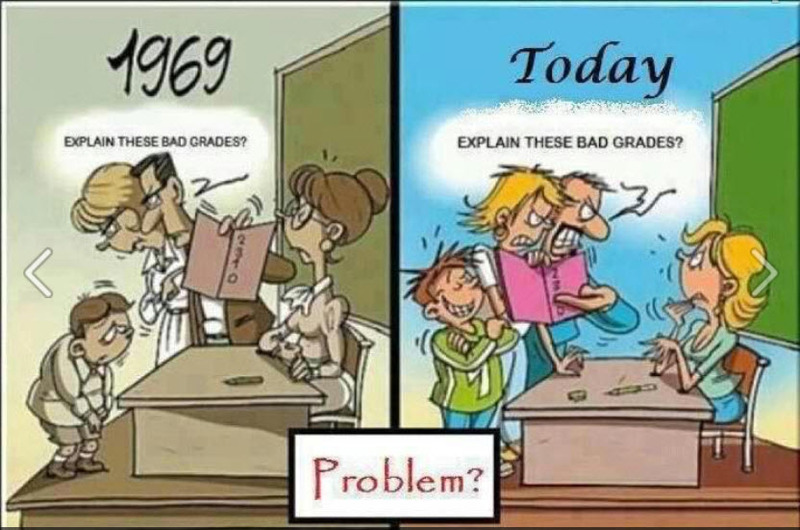 Students today get better grades for doing less than their counterparts from the 1970’s. This teaches kids that they don’t have to work very hard to be successful, which does not meet reality or prepare them for the real world. In a study, children did better when praised for working hard because they could repeat that behavior or improve upon it. Children were afraid to try again if praised for being smart because they might fail the next time and no longer be “smart”. This obsession with self-esteem is harming our children and we can already see the effect of it in my generation and the kids of today. 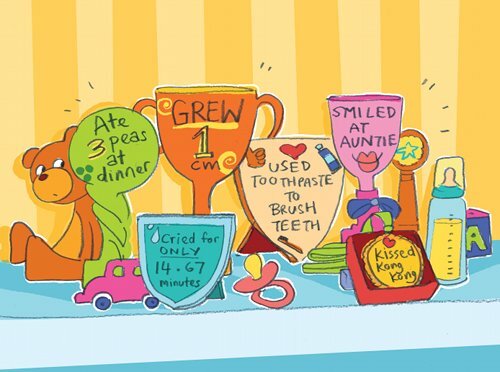 Society and parents are overpraising children, even for the littlest achievements or poor performances. Kids are told throughout their childhood how special they are. They come to expect praise for every effort they apply and are not equipped to handle failure. They grow up feeling entitled to success and are shocked when they get out of college and find that a job is not waiting for them on a silver platter. 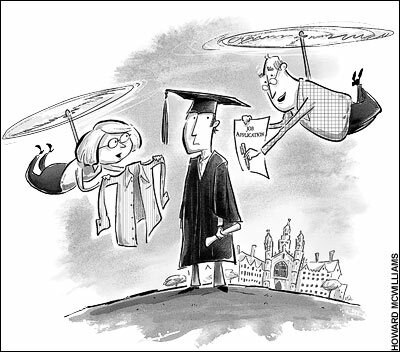 In fact, some have never worked a job before they graduate from college, because their parents wanted them to focus on their academics. Now these jobless graduates do not have the perseverance or the understanding that they need to apply to 150 jobs before they get an interview. Instead, they settle back into their parent’s house and play video games while tossing up a job application or two, all the while blaming the economy or their bad luck. Americans have passed up the not-so-glamorous jobs like trash collectors, lawn maintenance and house cleaners because rather than get a mundane job to support themselves or their family, they feel they deserve better and won’t settle for less. In reality, it would make more sense if they worked any job and also kept their eyes open and applied hard for jobs they’re interested in. Self-esteem should come after success. Self-esteem does not cause better grades, test scores or job performance. Americans have higher self-esteem, but perform worse on standardized tests than many other countries. Within the U.S., Asian Americans are the ethnic group with the lowest self-esteem, but they achieve the highest academic performance. Self-admiration is not promoted as much in other countries. Many other cultures focus on self-criticism and working on one’s weaknesses as the key to success. Mothers and grandmothers in Taiwan both agreed that self-esteem is not very important. Mandarin Chinese and Taiwanese do not even have a word for the concept of self-esteem. Americans seem to have an inflated sense of self because their self-esteem was always boosted and protected despite their average or poor work. Kids are special to their parents, but not to the rest of the world. It’s not helpful for parents to teach their kids that they are special and deserve special treatment, because they will never be treated as special in the real world. Even if they are above average in some area, they should be taught humility because no one likes an arrogant jerk. This seems to be counter-cultural at the moment, but parents and society should be teaching children that the world doesn’t revolve around them. Sadly, all the of the TV shows targeted at kids, the commercials, the advertisements and so on are teaching the opposite. (“If you use this product you’ll be special.” Or “Buy this! You deserve it!”) A quote from the book: “Compared to earlier generations, we’re emotionally closer to our kids. They confide in us more, and we have more fun with them. But we’re too indulgent. We give our kids too much and demand too little of them.” Overindulged children lead to outcomes like the 7 deadly sins: pride, wrath, envy, sloth, gluttony, lust and greed. No generation has ever done parenting perfectly. It’s important to recognize the cultural tides and fads in parenting styles of our generation so we can take a step back and decide if these are the values we want to pass on to our kids. Most likely, we’re in the same battle, so together let’s take up the fight against our increasingly narcissistic culture. Materialism, narcissism and entitlement are all things I hope to avoid passing on, despite the constant bombardment of these things all around me. I’m not going to worry about my kids’ self-esteem. I’m going to focus on whether they are serving other people enough….whether they are grateful for what they have…..whether they are working hard and building character….and how well they are loving those around them. Fantastic post! The entitlement epidemic scares me. (I actually read The Narcissism Epidemic last summer–followed my husband around for a week quoting the parts that really caught my attention. 🙂 ) I hope that we can combat this attitude somehow. I do the same thing to my husband! 🙂 It really put words and statistics to what I thought was occurring in our country and sadly I think the authors are right in saying it will take something huge to shake us out of it. I didn’t know you were either! How funny!